The HTC Vigor that was previously leaked through benchmark scores has surfaced again and this time through a decent pair of pictures, showing the entire front and rear side. 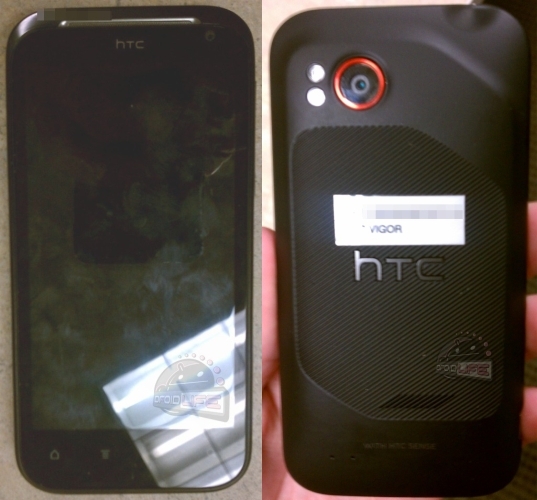 From the looks of it the phone does look a bit similar to the HTC Incredible S, particularly from the back. Then again, all HTC phones look similar these days. On the front is a large touchscreen rumored to be 4.3-inch in size and having a resolution of 1280 x 720, if the benchmark results that leaked last time are to be believed. There is also a front video call camera on the top right and on the top left is what looks like it could be the Verizon logo, blurred out. The touch sensitive buttons below the display don’t seem like they rotate the way they do on the Incredible S.
On the back sits the camera lens of what could most likely be an 8 megapixel sensor with dual LED flash, surrounded by the tell-tale Verizon red ring. You can see the Vigor name clearly written on the sticker below but as with the first image it seems the DROID name has been edited out again. You can see the loudspeaker slot below along with a sign that says that the phone will have the HTC Sense UI. On the hardware front the Vigor is expected to have a 1.5GHz Qualcomm Snapdragon processor with Adreno 220 GPU, 1GB of RAM, 16GB internal memory and running on Android 2.3.4. It is also said to have the Beats Audio, the result of the recent alliance between HTC and the Beats by Dre brand. All the signs suggest this is another one of the phones from Verizon’s DROID family but there could also be a GSM version, the Incredible HD, if you will. This is all we know for now though. More as it is discovered.